Every few years, a board game comes along that is so well designed, it stands out among the hoard of new titles. I’m here to tell you today that Scythe, published by Stonemeier Games in 2016 and currently ranked #8 on Boardgamegeek.com, is one of those titles. This is also one of the few games I’ve played that, although I’ve only played once, I don’t feel like I need to play it more to accurately determine whether it is truly a quality game or not. Furthermore, event though there’s been a lot of hype over Scythe, I actually went into my first game with fairly low expectations. 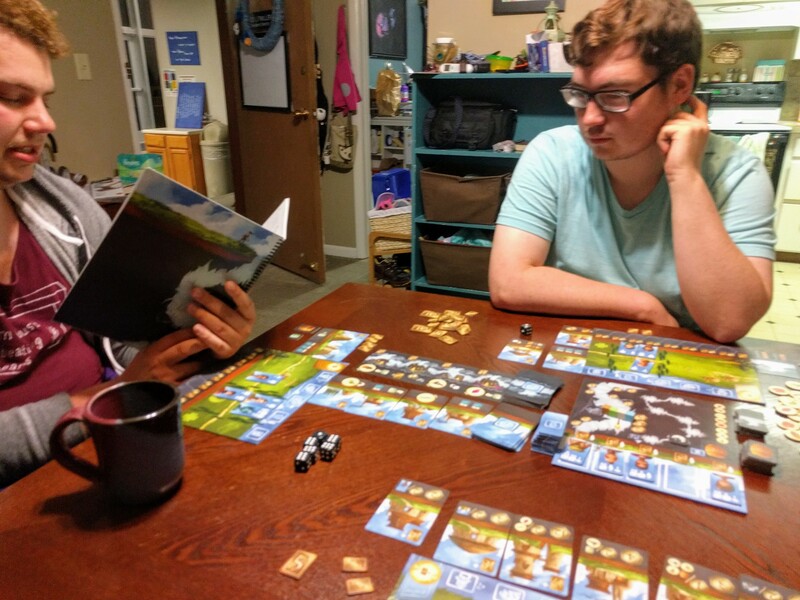 As I play more and more games and grow older, I’ve learned that Area Control and Conquest style games (such as RISK) really are not my favorite genre. In fact, they’re one of my least favorites. 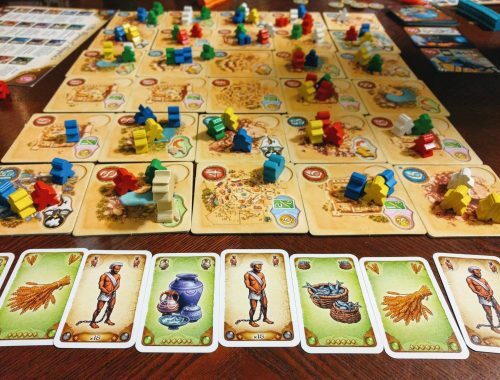 I have come to enjoy them more recently if there are other aspects of the game that distract me from their core mechanics, but at heart I enjoy casual games and Resource Management style Euro games (see: Concordia). I grew up playing a decent amount of Sim City on the computer and I love that aspect of building up a city managing its various resources to keep it from toppling. 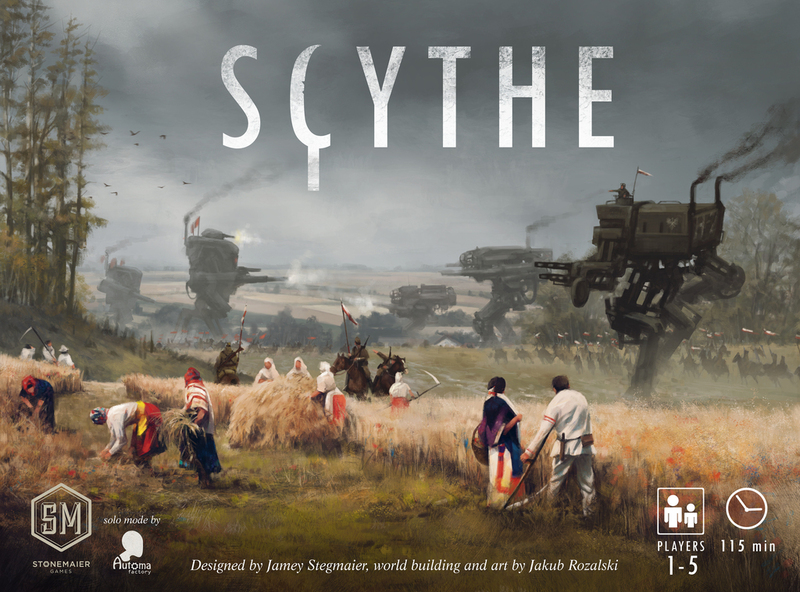 Scythe takes place in a post WWI alternate history setting with beautiful artwork. 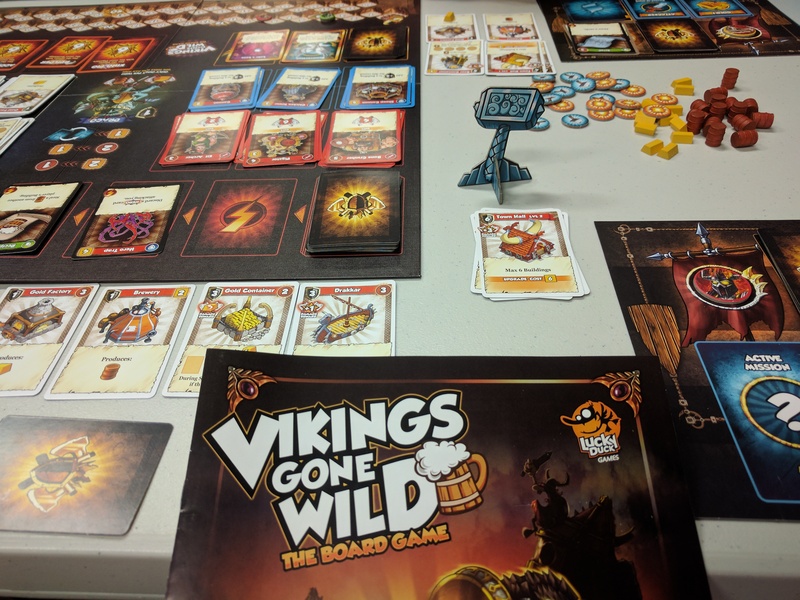 Players are given a faction board and an action board which are independent of each other and determine possible actions and costs for that particular game. The scoring system is somewhat complex but I felt like I understood it fairly well about halfway through my first game. Essentially, when the first player earns their sixth star (through various achievements) the end-game is triggered and players calculate points, which are based on the number of stars placed, the number of hex tiles controlled, resources, and built structures. However, your point multiplier for each category is your population. Although population can be a resource, it’s never a bad thing to have a high population because it increases the value of all your other scoring categories at the end of the game. Play goes like this: on their turn the active player moves their pawn to one of the spaces on their action board. Then they take either the top action, lower action, or both. Some actions have a cost associated with them but some do not. The upper actions consist of moving your units, bolstering to increase military power, trading to gain resources, or producing resources. Lower actions include upgrading your possible actions to make the upper ones more efficient and the lower ones cheaper, building a mech, building a structure, or enlist (which gives you bonuses for when you or other players take a particular action). Your possible actions can even be expanded by moving one of your units onto the center hex of the board to gain a factory card. These factory cards typical give you powerful actions but come with a heavier cost, such as losing population or paying more coin than you would for a basic action. Let’s talk about resources and combat. First, resource tokens always stay on hex tiles after they are produced. A player can move resources with their workers and units (mechs/leader character) but can only spend resources when a worker is present. A worker must also be present on a tile to produce a resource. Combat is simple and takes place when a opposing player moves one or more units into a hex where there is another player’s units. Players spend power and can play combat cards and compare, the winner gaining a star for their first two combats and the winner retreating to their base. This is one of the mechanisms that I love the most about Scythe, that you never completely lose your units. The winner loses popularity equal to the number of workers on the losing that are displaced by combat but keep any resources that were already in the hex. In hindsight, I should have seen that I would love Scythe more. At its core, Scythe is a medium to heavy weight Resource Management game with a splash of conflict. In fact, I really feel like the game strongly discourages players to be overly aggressive but rewards you just enough to make it sometimes worth it. There are some incredibly interesting aspects of combat and interactions between players- you might stockpile a bunch of resources that are easy to produce and bait your opponent to attack you but also have a lot of workers in the hex, causing them to lose popularity if they attack you. There is just so much depth here, and although I have no idea if all the factions are truly balanced, I don’t know that it actually matters. There’s enough going on that players can’t math everything out and will keep each other in check as long as they learn to realize who is doing well. 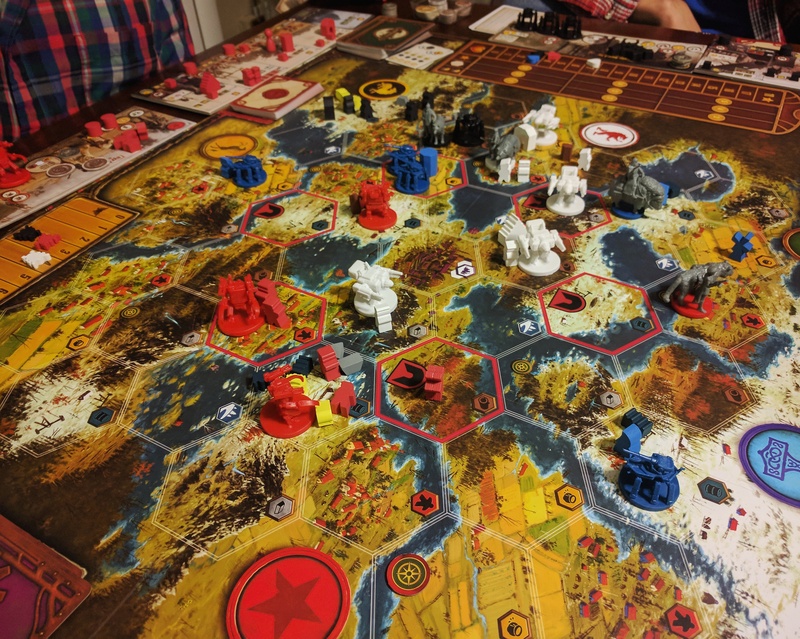 To sum it up, I think the most amazing thing about Scythe is it’s incredible depth and complexity, while being super accessible for new players and even gamers who have played little more than Catan or other medium-weight resource management games. The only minor critique I would make is that the scoring system is initially a little tough to wrap you mind around for new players. However by the end of their first game most people will have no problem. 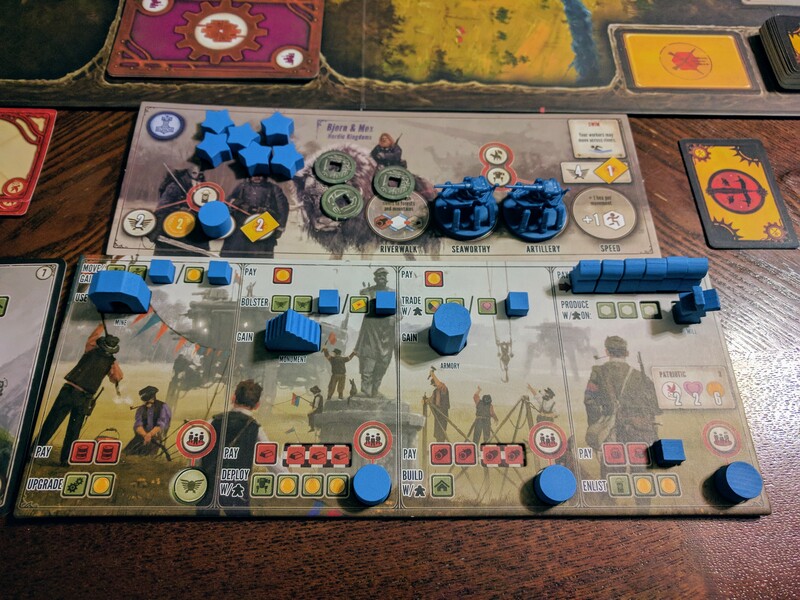 My first session lined up with many reports that I’ve heard in that any typical game of Scythe has around 2-3 conflicts for a four player game. If you like Euro/Resource Management games, you owe it to yourself to try Scythe. If you enjoy conquest style games such as RISK, you should give it a shot. If you just like incredibly well designed, streamlined games with amazing artwork, you have to play it. 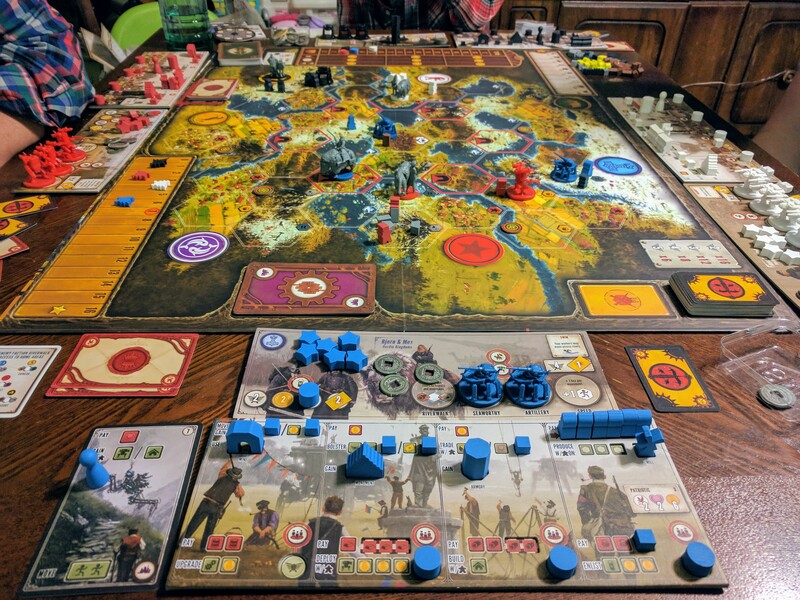 Scythe is one of the best board games I’ve ever played and I cannot recommend it highly enough. I give it a 9.5 out of 10.